Instead of making up our own traffic calming designs, we should simply adapt and follow the best practice engineering standards that are proven to work. The following photograph was taken at the intersection of Roxborough and Province near Queen Mary Elementary School. I am impressed! I want this permeable traffic filter for Durand! Roxborough is a residential street. It was a notorious rat-run right next to the school that was an extreme danger to school children. Now it has been reclaimed by the community. Herkimer is a residential street. Right now it is a notorious rat-run right next to Herkimer Park, posing an extreme danger to children using the park. Let's reclaim this for the community. Better yet, we should systematically eliminate rat-running cut-through car driving from all Hamilton residential neighbourhoods. Take a look at this description and video of how to convert a residential neighbourhood to unravel the networks of car and bicycle routes. In some cases the separation of routes is achieved by building of cycle-paths. However, in many others it is achieved by removing cars from the roads. These days, very many roads and streets are not part of the route network for cars. They still allow access by car, so that people who live along them may reach their own homes, for instance, but they are not through routes by car. As a result, such streets are absolutely not dominated by cars. A cyclist using a road on such a route has much the same feelings about safety as someone using a cycle-path. Here is the key quote: "Residential streets in the Netherlands rarely work as through roads for cars, even if they were originally designed to do so." They changed. We can too! "effective width next to bollard (a) = 1.5 (1,00) m; in the absence of alternative route, a passage of 1.2 m (to allow invalid vehicles)"
I can testify that in real life, 1.5 m is invariably used except in the most extraordinary of circumstances - for example, the presence of a statue of historical significance. When bollards are too close together, it is more difficult for bikes to pass between them. Wider cargo bikes may not be able to fit through at all. With a different placement of the bollards and planter box, this could serve to moderate automobile movement while still allowing bikes to proceed safely in the right lane. Instead of making up our own designs, we should simply adopt and follow the best practice engineering standards that are proven to work. To me it's a problem of perspective. Most people working in the transportation department do not have the perspective of a cyclist or pedestrian - they perceive the environment only from behind the wheel of a car. Until we start looking at issues from multiple perspectives, infrastructure that doesn't serve the needs of pedestrians and cyclists will continue to be the norm. It is also an issue of qualifications, training, skills and experience. I would love to be corrected on this, but as far as I am aware the number of City of Hamilton staff that are trained and qualified Bicycle Traffic Design Engineers is precisely zero. To the best of my knowledge, there is no equivalent North American degree or professional qualification to the Dutch "Bicycle Traffic Design Engineer". If such an education infrastructure were available here, I'd be the first to sign up. For what it's worth, there are alternatives. For example, I went to Portland for a week-long comprehensive bicycle planning and design professional development course, complete with daily bike tours, hosted by Portland State University. I have tremendous respect for the Dutch engineering standards but surely they can't be the only ones allowed to certify professionals as good engineers for cycling infrastructure. Yes, such a program needs to be started here. Perhaps at McMaster University's Civil Engineering department! The City of Hamilton contracted the design of the Cannon Street Cycle Track to a third-party transportation company, IBI Consulting. I note that on the "Traffic" part of IBI Consulting's web site they make no claims whatsoever of having qualifications, training, skills or experience in Bicycle Traffic Design Engineering. IBI did provide one piece of spectacularly bad advice, which was to put the planters off-centre, taking away space from the Cycle Track. This leads me to seriously question their competence. Although effective, bollards are not very attractive to look at. But - I really want to better understand how this could work in Durand. Would love to see your blue sky ideal for Durand traffic calming. I just spent a week in the Glebe neighbourhood of Ottawa and they have a number of traffic calming / permeable filters to limit neighbourhood traffic, particularly from Queen Elizabeth Drive at the neighbourhood's Eastern edge. As a tourist, this was frustrating at first as I often had to take very long detours to get where I needed to go. However, I could see the benefits for residents as it would keep through traffic to peripheral roads and the main commercial street (Bank). In Durand, I would assume this would mean keeping through traffic on Queen (likely requiring 2-way conversion), Main, King, and James. Would an east-west through connection not still be required at the south end of the neighbourhood though (i.e. Herkimer / Charlton)? Yes, traffic planning needs to be done on a systematic, city-wide basis. Otherwise, the situation that you describe will indeed happen. This situation already has happened in Durand. The ultra-rich in their mansions on Aberdeen used their clout to make Aberdeen no longer a through route for car drivers. Since this was not done systematically in Durand, the effect is to dump extra rat-running car traffic on Herkimer and Charlton. The right way is to use a sector strategy for the whole city. The way this works is to use the QEW/Red Hill/Linc/403 as a ring road around Hamilton. Hamilton is then divided into sectors, using existing neighbourhoods. People walking, cycling, or using public transit can go straight from A to B. But car drivers cannot drive straight from one sector to another. They have to drive out to the ring road, drive around to the destination sector, then drive back in again. This systematically eliminates rat-running from EVERY residential street and neighbourhood in Hamilton. To see how this works in action, an excellent example can be seen in this video of the city of Groningen. The effect in Groningen was to push cycling mode share to over 50% and car driving mode share to less than 20%. And make the city a people-friendly place that is pleasant to live in. I hate to throw cold water on this, but we need to consider politics. The experience in the North End is that a systematic traffic management plan, produced by IBI, and approved by an OMB decision (the City was ordered to implement the plan, while the reduction of speed limits on most streets to 30km/h is a 5 year pilot study) has been modified by petition twice now ... first to eliminate chokers and bumpouts to preserve street-parking spots east of Mary St. and last week to remove a partial closure northbound on Bay at Burlington. The first petition was done by a resident in the area and apparently garnered widespread support. The more recent petition was carried out by a newly formed group called the Progressive North End Neighbourhood Association, run by a prominent local architect who I'm told opposed most proposed street closures during the consultation phase of the traffic management plan. I'm not going to comment on the North End plan, or the wisdom/effectiveness of specific techniques or features in it ... my point is that you can't simply treat this sort of thing as a technocratic venture, or the politics will eat it alive. I wasn't a resident of the North End when the plan was devised and debated, but there was broad support I'm told, including a petition calling for measures to slow-traffic and reduce cut-through volume on local streets. Even now, I frequently hear support for the reduced speed limit, but grumbling about other aspects of the traffic management plan: closures, turn restrictions, bollards, bumpouts, chokers, etc. Public works and motorists from elsewhere are only part of the problem, I'm afraid. I wasn't commenting on why we need traffic calming, better pedestrian infrastructure or protected bike lanes ... or how to sell them. I was commenting from direct experience ... watching a comprehensive, systematic plan be modified, post-hoc by petitions from critics or unhappy residents. That's happened already to the North End plan, and none of your three suggestions would have gotten proponents very far i'm afraid. I recall a public meeting after only a small amount of the implementation had occurred. One old-time North Ender got up and said "sure some children have been hit by cars over the years, but that happens everywhere." Another blamed the problem on "parents today" and noted that none of his children died and the streets were busier back in the day. Some in the audience were clearly unimpressed, but a surprising number nodded in approval. A couple of people in the audience shouted it was like urban renewal again with the city forcing stuff on us to fix the North End, etc. That last comment would give me pause about the new city rhetoric. It appeals to people who read RTH, but falls flat with many others ... some will misunderstand and turn outright hostile. Many people, when asked, will politely say they support 30km/h, but think the money for the traffic calming changes would be better spent on fixing the roads period. I'm not raising this to suggest not pushing for changes ... your suggestions in the article make sense to me. It's more about the politics of actually getting and keeping the changes. Trust me I spoke up at one meeting and outlined the relationship between speed of a car and the death of person hit by car. I'm aware of the talking points in favour. The political problem is a little beyond rational argument ... that's my point. I am a Marxist... Groucho, not Karl. Rob, Durand has experienced the same phenomenon here. Conversion of Duke and Bold Streets to two-way was on the PB ballot and won as a project for 2014. Some residents of apartment buildings along Duke and Bold freaked when they heard and bent Jason Farr's ear so that now those conversions have been put on hold. Kevin, I think you were at the meeting at City Hall when Jason Farr listened to a long line of complainers who defended garbage truck drivers trying to navigate those "narrow" streets. The progressive ideas are fine, implementation when non-engaged citizens find out is another thing entirely. are you serious?? People complained about Bold and Duke? Farr should know better than to cater to people who have no clue what they're talking about. My street is MUCH MUCH narrower than Bold or Duke and it's 2-way with parking on one-side 24-7. And speeding is STILL a problem. We already have examples right in Durand and Kirkendall of street intersections where automobile movements are restricted (perhaps coincidentally, both are in the most affluent areas of the respective wards). In Durand, Aberdeen Avenue turns two-way east of Bay Street South but then turns one-way westbound about 100 metres west of James Street South/James Mountain Road. As a result, you can't drive eastbound along Aberdeen to James. In addition, northbound traffic on James Mountain Road can't turn left onto Aberdeen (turning is blocked by a median and bollards), though southbound traffic on James can turn right onto Aberdeen/Inglewood. The way it works is that people choose other routes to get where they're going. Yes - I understand in principle and am aware of the benefits to these affluent streets. In the cases of Aberdeen and Amelia, their benefit comes at some cost to surrounding streets that absorb the additional traffic. I would love to reclaim Herkimer and Charlton as neighbourhood streets that are safer for all, particularly for children playing at Durand Park. However, my current viewpoint is that calming should be achieved by the narrowing / reduction of lanes, speed humps, addition of bike lanes, and additional lights / pedestrian crossings. I'm trying to understand if Kevin is suggesting to implement a solution similar to the one at Roxborough and Province at Durand Park, placing bollards on Herkimer at Bay and on Charlton at Park. If this were done, what other changes would be needed to accommodate the re-routed traffic? Would other streets be significantly negatively impacted? Or is this not what Kevin is suggesting at all? I used to think it was crazy to eliminate through traffic from herkimer and charlton but now I see that it is necessary if we expect Durand to be a neighbourhood. We must ask what destinations these streets are being used to access. THe reality is, most traffic on the streets can be served by our true arteries and should not be anywhere near these streets. Try to drive through a Toronto neighbourhood on any side street - you can't. You have to go to a major street to move between neighbourhoods and only drive on side streets for the minimum distance required to reach the address you're going to. these streets are only through streets because we built them that way, and will continue to be through streets until we do something about it. As long as we let through traffic use them, these will continue to be extensions of the 403 ramps for ever and ever. We need to decide what streets are truly going to be our arteries and cut through traffic from every other street. Totally agree. That's why I'm trying to have a dialogue to better understand how it could work in a Hamilton context, specifically Durand. Two way Queen would go a long way to calming Herkimer. At present morning rush hour commuters are funneled on to Herkimer; aided by slip turns; when many are making their way to Main and King. Why not provide them the direct route of Queen St? Take a look at the photo. The permeable filter is designed so that emergency vehicles can drive straight through. 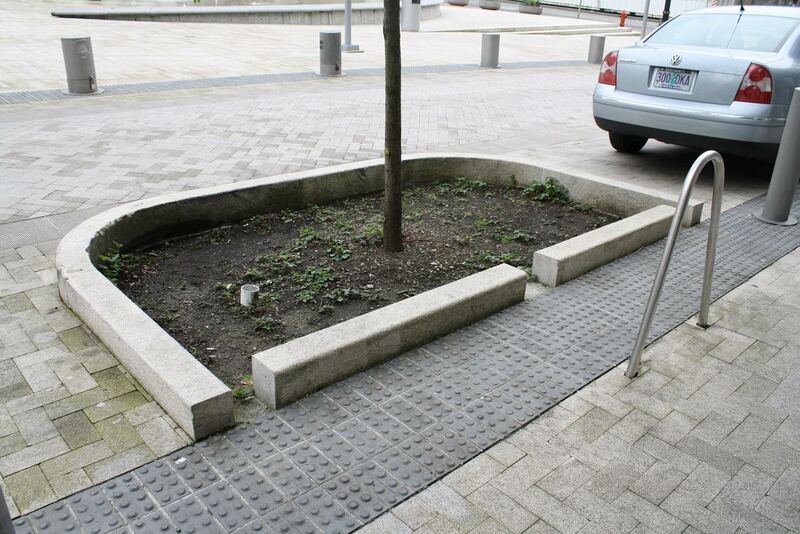 The bollards are designed to be knocked down when an emergency vehicle drives over them. Couldn't agree more! For me, this is the number 1 change to push for in SW Hamilton now that the Herkimer / Charlton bike lanes are finally about to be installed. I know many in Durand / Kirkendall have been working towards this for years! I would like to see cement barriers placed through out the city in all neighborhoods to prevent rat-running but still allow pedestrian and bicycle traffic. We do need prettier bollards. That said -- this is a start to further area improvement, and to reduce rat running (which I'm, admittedly, guilty of doing, too, as an automobile owner) When the city finally does a full repaving of the worn parts of Barton (bound to happen eventually out of sheer necessity), we need to do the street 'properly' -- and install prettier bollards (that are also bike-pass-through friendly). Or a real bumpout, or -- maybe -- even parking-protected bike lanes on Barton. I don't know what the proper fix for Barton is, but it will be interesting to hear what is in Jason Thorne's mind. Also, the octagonal cutouts for trees have rubber covers that are currently killing the BartonBIA trees. The octagon cutout in the sidewalk (for tree) at Barton St E and East Ave N has an iron grate in it, and the tree is much healthier and twice as tall. But the other octagons have rubber covers (was there metal theft on tree grates many years ago?) and the soil under them is bone-dry. Some dead branches on those stunted trees. 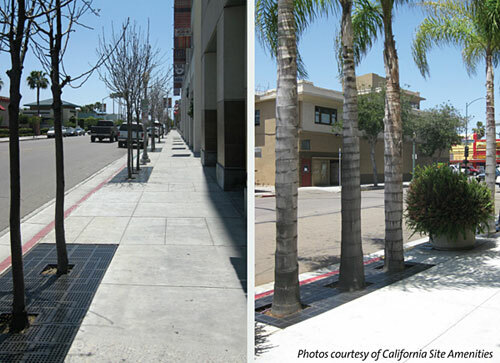 Iron grates for pedestrian trees have been around for over 150 years -- for a very good reason: They allow the trees to be naturally watered. 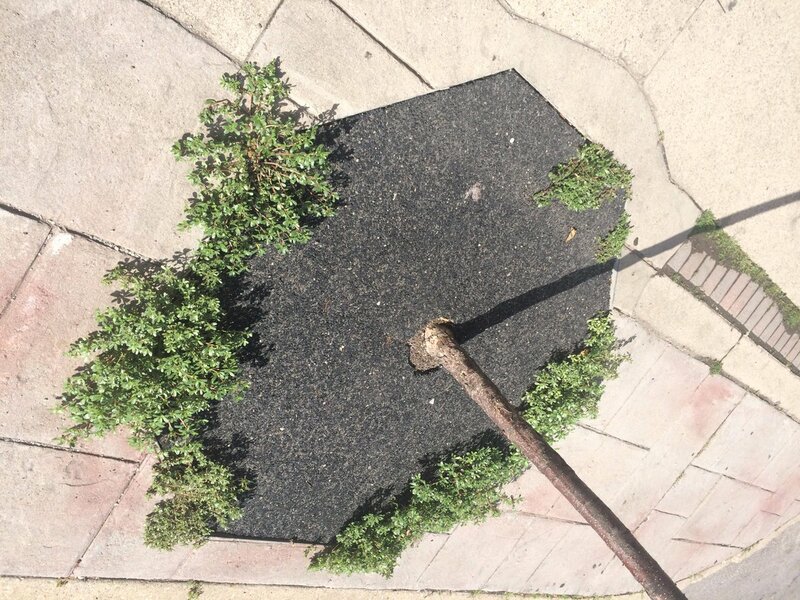 As an interim measure, someone needs to bring scissors to cut out approximately 0.5 meter radius circular openings in the rubber mats choking the BartonBIA sidewalk trees.. This won't be perfect, but this will prevent further tree branch death until money can be raised to reinstall real iron grates around the sidewalk trees (that are hopefully locked down). Look at how healthy the tree (at Barton and East Ave) with the remaining metal grate is -- it's twice as tall as the other trees. Yet that tree was planted at the same time as the others. It's naturally getting water, thanks to the metal octagonal grate surrounding its trunk. Unlike the others that received impermeable rubber mats. actually, it's the other way around with the trees. Iron grates kill the trees. Check out the trees downtown where the trunks have literally been sliced by the grates as the trees grew too big for the small steel hole. 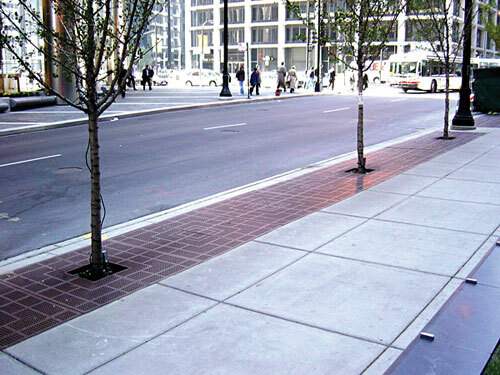 Best practices for urban tree planting involve planting areas with no restrictions on the trunk. Correct about best practices for large holes... However, for Barton's situation, it's different. ">>actually, it's the other way around with the trees. Iron grates kill the trees. Check out the trees downtown where the trunks have literally been sliced by the grates as the trees grew too big for the small steel hole." This could be true, but this is not applicable for the Barton trees at all. The trunk hasn't grown big enough to be sliced by the iron grates. There are poorly designed iron grates, but there are also 100 year old urban trees still growing out of their original iron grates. It's a matter of making sure the diameter of the hole is big enough to project many decades into the future. When I visit some places like Boston, I see old grates with big hole and huge trees. The rubber covers that were installed at Barton are the non-biodegradable non-permeable type. Go there next time after a massive torrent rainstorm then peel up the rubber, and you'll see the bone-dryness. Sure, sure, all the nouveaux stuff like compostable plastic bags to other things, but the reality is that they lower the quality of compost compared to avoiding them. This is just another one of them. YUCK. It's easier for city municipalities to make mistakes with rubber covers than with metal grates. I'd almost rather see a tree live to 50 years and then die from iron grate choke then; rather than see trees die after 5 years and get replaced only once every 10 years, resulting in a stubby half of the time that a typical city does not bother replacing for many years. My spouse has a 2015 Hamilton Trillium Award winning garden, and we've talked to a bunch of horticulturists has been talked to. While I agree with you generally, this is completely inapplicable to Barton, given (A) metal grate hole isn't limiting factor, and (B) the rubber they chose is the wrong impermeable type; necessitating a fix anyway. Tiny metal grates, yes, are a pet peeve of mine. But the barton grates are fairly decent sized and already automatically permits longer-than-worldwide-municipal-average urban tree life. The rubber covers that were installed at Barton are the non-biodegradable non-permeable type. Go there next time after a massive torrent rainstorm then peel up the rubber, and you'll see the bone-dryness. If that's true, that's ridiculous. The city knows better. The new trees that were planted on York when it was redone a few years ago were all dying due to the metal grates, so the city has been going around, replanting, and opening up the base of the trees for water to easily flow and so the grates don't squeeze the trunks. 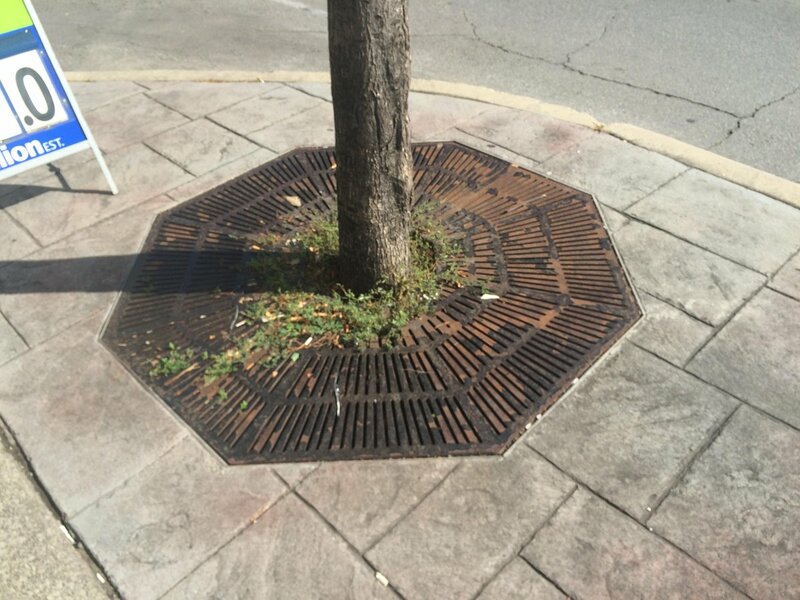 Not often a tree will make it to 30 years in a metal sidewalk grate like the ones we use. Again, York Blvd trees were all dying over the past couple years and they were only 3 years old. The pattern was the same -- all areas with rubber mats had anemic/slowly dying trees. I lifted a corner of the rubber mat after a rainy day, and the dirt was bone dry. The lack of water is killing the trees and stunting their growth. There may be a reason the coverings are there; to keep weeds from growing. But it's permanently killing the trees. All octagons that had rubber mats; all had anemic looking trees, unlike the ones with metal grates. In the light of budgetary constraints, absentee landlords avoiding paying BIA fees, someone for now needs to bring a scissors to all rubber mats to enlarge the dirt opening around the trunks. Would take 1 person only 2 hours to do the entire Barton BIA. So easy that even a citizen could do so. And hopefully we'll see more tree survival at least until the Barton BIA can afford the re-install of metal grates. I realize that the BIA has gone through hard times and it's a nice asset we need to try and nurture, especially as new Barton anchor points appears to have come recently (e.g. 541 Cafe, La Luna Express, etc) and we can see it gradually improve. When the area is next rebooted, the 'fancy' BIA area should also be extended one block all the way to the hospital because that's where the target market comes from (hospital staff, bike lanes, etc). With such connectedness, more people will mill the BIA. All the half-hearting on Barton like ugly bollards, quick rubber-mat fix for stolen metal grates (or never-purchased? ), to other things like these, makes it slightly dissapointing in a "failed revitalization" feel -- and this is in need of TLC by a city planning superstar (like Jason Thorne and his James St North success, but he's got his hands full on other revitalization projects and he's now leading LRT-related revitalization planning). I hope we've got someone to look into Barton rebooted re-revitalization, especially as surrounding areas revitalize with the King LRT, James North, SoBi expansion, etc. 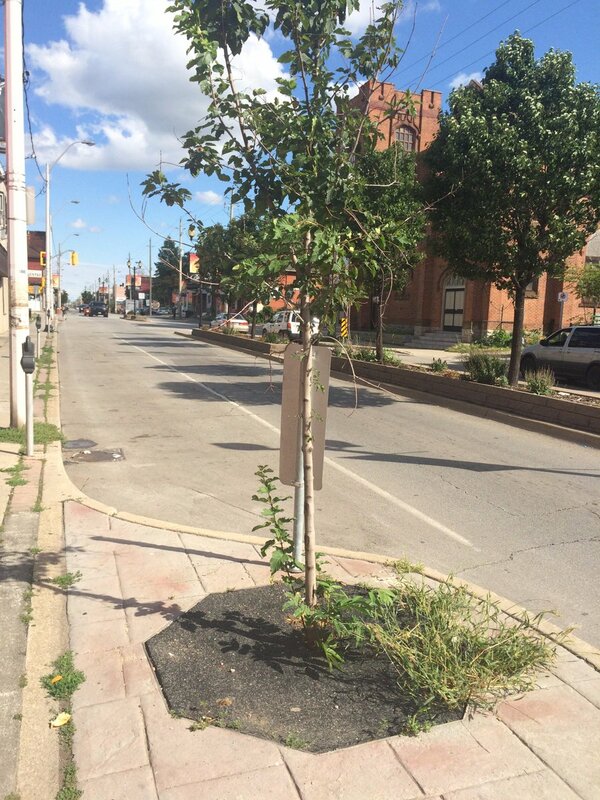 But the city (or BIA) must take action on the dying trees to send a volunteer. A quick 2 hour no-cost citizen fix of applying scissors to these rubber mats (something that was done against professional horticulturist recommendation). Heck -- we could even intervene ourselves for just 2 hours, and save the city tens of many thousands dollars in future trees; as water-starved dying trees will often successfully rebound when water comes back. There were approximately 8 areas with the rubber mats along the whole BIA -- but I think there is more than a dozen. Assume about 5 minutes of scissors work per tree. We really need to get city hall to build the sidewalks surrounding trees and flower beds with curb cuts that direct rainwater into the planting areas. The new West Harbour GO Station planting areas. Go check out the curb cuts and deep water wells. Also, one of my favourite hidden spots in Hamilton: the courtyard garden area at Good Shepherd Square on King West between Ray and Pearl. Again, rainwater gardens that collect rain, NOT direct the rainwater into the sewer system. These trees you've noticed above are all not looking very healthy, even the metal grate ones. It's been a dry, sunny summer and it doesn't look like city hall has installed any of the rain water bags or had the watering/maintenance crew along there based on all the weeds and shabby look of things. The ones with metal grates are just getting thick enough trunks where they will start to die in the next few years as the grate squeezes and kills the trunk. Again, they chose the wrong kind of rubber, or something happened. As you can see, I trust a city to screw up with metal grates (tree dies in 30 years), than to screw up with rubber mats (tree dies in 5 years). Perhaps some city shopper found something labelled "biodegradeable" but there's a huge difference between 1% water-permeable and 50% water-permeable. I couldn't detect any iota of water permeability; maybe the rubber fiber is currently clogged with snowplow dirt over the years, that it's become water impermeable over the years. What matters is the end of the day, making sure the trees has water, one way or another. So you see, 2 hours of intervention is still needed to protect for tree's life until a permanent solution. Rubber mats are just a stupid horticultural risk, much like rubber-tire maritime reefs or the common newbie mistake putting a rock garden around a tree trunk (for some trees; this is very bad) or good-intentions-but-has-gotchas such as plastic compost bags, etc. There's always gotchas, and I really do not trust rubber mats for urban trees. It's more my spouse. I learned a lot about some gardening information from my spouse, who talks to lots of horticulturists. We have 2015 Hamilton Trillium prize winning gardens (white Trillium so far) at our house. Apparently, I saw two rain water bags that are now fully dry. Only two (not sure if there were more), out of 8 that I looked closely at. I think dry rain water bags are worse than having no rain water bags, as it is now blocking the way. I don't know if it's being refilled regularly. Hamilton has no proper grates anywhere in operation that I've been made aware of. I like Portland's solution. It's "city-neglect-resistant", meaning trees often can duke out 5 years of neglection, before the city addresses problems, etc. I do too. It's actually being done world-wide. Just not here. Why not direct rain water into planting wells instead of putting up curbs to block rain water from getting in? We get enough snow/rain here that native trees would almost always thrive in those types of planting beds. Check out NYC going all-in for those planters. Not just because it's good for trees, but because of the tons of rainwater it diverts from the sewer system. Edit: I noticed last week on Concession that the city couldn't bring themselves to cutting curbs to encourage rainwater into the new flower beds being built there, but they kept the sidewalk flat right to the edge of the gardens so rainwater should flow in. It's a small step forward compared to the flower beds on King near the Gore or York near the Coliseum where the city actually built curbs to keep rainwater out of the planters. If you want to make an article out of this, feel free to do so. It'd be nice to have an RTH article about urban trees. Quite the side topic here -- simply because Barton came up, I had to chime in. there's been quite a few over the years. search 'sidewalk trees' in the search button at top right. 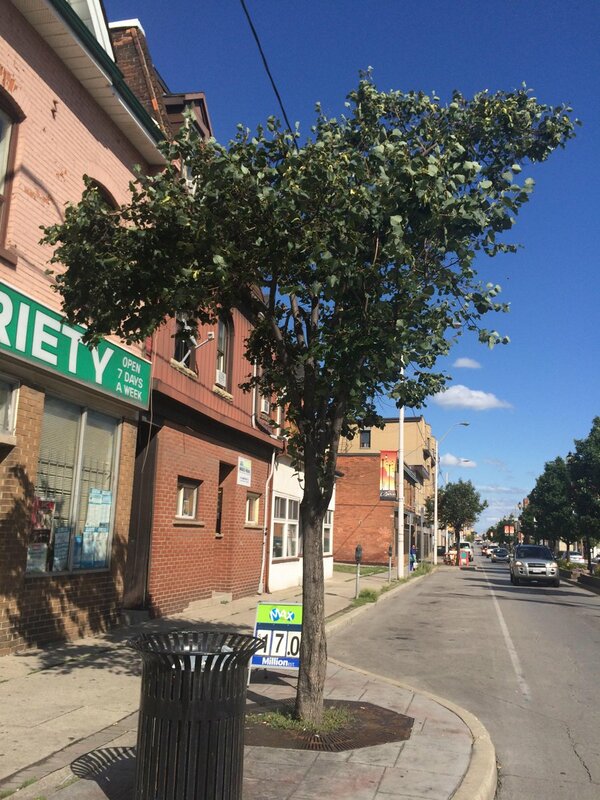 Hi, Just wanted to follow up from Barton Village BIA about the trees - I have emailed the city to see what can be done - for further information about this mater please contact me directly. I also wanted to take this opportunity to see if anyone is interested in helping to make Barton St safer for cyclists. We are looking at starting a team who can spear head this initiative and go to the city with a proposal. Glad that I got the attention of the Barton BIA! (I tweeted to them with a link to RTH comments about dying trees). Hope a solution comes up. Regardless of what you do, I recommend removing the mats until a permanent solution as it appears to be the wrong type of rubber. Of if they must be kept for now, due to lack of budget for weed control, then perhaps cut a bigger hole in the rubber around the trunks -- even if you have do it yourself (should only take 2 hours for an experienced person with a good pair of heavy duty clippers). Something to protect the trees' survival until a permanent solution can be afforded. Over the long term I hope more businesses open in the BIA, new bylaws force shuttered storefronts to open for businesses (perhaps a law that forces owners of businesses to offer their buildings for sale instead of converting a storefront to tenant rentals). I also heard (from multiple sources, including via my spouse who goes to Sherman Hub meetings) that there are tax credits for unoccupied businesses (perhaps to help out a building owner unable to rent out for a storefront? ), and also that sometimes this tax credit is bigger than the low rent. The side effect that seems to be created is that perhaps some older landlords of fully-paid storefront buildings, keep a store shuttered to collect this tax credit (more lucrative) rather than renting out the storefront at low rents. The more adjacent shuttered store fronts, the rents fall, and the shuttered storefront effect self-amplifies and spreads like a disease even if there's now latent demand to revitalize. This unintended side effect of trying to support building owners having failing businesses, is affecting Barton (via amplification of shuttered storefronts, lowering rents, causing all buildingowners of storefronts in the area to prefer to take the tax credit rather than offer low rents -- because Barton rents are so low, that the tax credit is bigger!) and this needs to be adjusted or ended, by ending the tax credit, forcing the buildingowner to sell the building to some developer that will revitalize the building instead. This otherwise benevolent tax credit originally aimed to help failing building owners, is unintentionally causing a malicious effect on Barton. For many (most?) of the buildingowners of shuttered storefronts, the building is already paid off, so it's not like we need to protect them with a tax credit, unlike back in the downturn era where the tax credits may have made more sense; they can simply sell at a profit (thanks to LRT value raise) to some willing storefront-revitalization developers once the tax credit is removed and they have no incentive to keep the building vacant. This needs to be high priority in any list to improve the Barton area. I believe Matthew Green is now aware (as far as I know -- but any opportunity you meet him, please bring up the issue of de-incentivizing shuttered storefronts via removal of tax credits to building owners of vacant businesses, and re-incentivizing opening of businesses), and hopefully some action can occur on this sooner than later. One more-expensive modification is that the BIA should grow all the way to the Hamilton General Hospital, as hospital staff is a prime target audience and we've got a complete full block of shuttered storefronts firewalling that audience and discouraging them. I was visiting someone at the hospital and was struck how firewalled/insulated the BIA was from the crowd of people milling in front of the hospital; this needs to be fixed in any BIA reboot. A lot of the existing stuff is already nice there, and only needs minor repairs (e.g. remediating the trees, weedwhacking the weeds growing out of cracks, fixing broken Xmas lights, etc). This is fodder for a new article -- for somebody else interested in writing an article about rebooting the Barton BIA (With the new information known, like LRT now funded) -- as a Barton BIA reboot will be a topic of interest, with the encroaching good businesses (e.g. La Luna Express, 541 Café, etc) book-ending the BIA area and the LRT to the south, plus the new Cannon bike lanes, more SoBi infrastructure, future big increases in service to West Harbour GO station, etc. Victoria and Barton needs to be turned into a fancy intersection. There's a SoBi station, there's the plaza of Hamilton General Hospital, and there's the Victoria bike lanes. So a fancy intersection to attract pedestrians, maybe a gate of arches over Barton at Victoria, as a special draw to the Barton BIA. Not sure where the budget would come from, but there are dozens of people milling about, smoking outdoors in front of the hospital, and the BIA needs to become a tourist trap to these people milling about in the hospital plaza. Wheelchair-friendly signaling and fancier painted crosswalks that attracts even the old/disabled to go a little further. The Victoria-Barton intersection needs to be visible as a fancy gateway intersection of some kind. If budget is tight, then do a fancy themed crosswalk or possible "milepost sign" at one of the corners. It needs "pull". This also means high priority in "breaking the firewall" (eliminating the shuttered storefront section- east of La Luna Express, to make it open and welcoming to the pedestrian density that's occurring in the Hamilton General Hospital region. Right now, Barton BIA is not. Work in breaking the firewall needs to be made a capital maximum priority, including maximum de-incentivization of keeping a storefront shuttered (elimination of any side-effect-tax-credits, etc), and this needs to be done ASAP -- and I mean ASAP -- since this is the cheapest fix without installing new infrastructure yet. With more businesses paying BIA fees, surgical improvements can occur in the interim until full BIA reboot funding (if any later). With the LRT being built not far south, this is a grand opportunity to "reboot" the Barton BIA within ten years, like another pull on a sputtering gas lawnmower after giving some very loving TLC to the motor (bylaw changes, eliminate the "shuttered storefront" tax credit, infrastructure changes, one block extension of fancy area to Victoria Ave for hospital, additional SoBi infrastructure), business value goes up, and we can get the area to purr nicely in ten years. Although this may not be applicable to Barton, some nearby bike routes may be considered for this. This is a good way to win skeptical automobile owners too because, you know, #hamont is a strong automobile population. Permission granted to any RTH author for usage in any future articles about parking protected bike lanes, please credit www.vimeo.com/cupola/speck3 as that is the original I derived using framegrabs. I also have a much bigger 1920x1080 animated GIF, please contact me for the two original GIF frames if you want something bigger. This is good! The only quibble I would have is that for a two-way street that is not against some natural barrier such as a river, railway line or escarpment, it is better to have two lanes on each side of the street rather than one bidirectional lane. True, the Right Tool for the Right Job. ... That said, some special considerations -- if you have two separate parking protected bike lanes on the same road, you have less space for the dooring zone, as you now need two dooring zones. And for roads too narrow to have separate set of parking protected bike lane with big enough dooring zones, it's now better to just create a full bona-fide cycle track and upgrade it to full green paint infrastructure and a dooring zone wide enough to eventually install a bike-lane-protection curb or bump in. I've seen some of them get "the green paint full cycle infrastructure treatment" over time, something that wouldn't have been as easy if they were on separate sides of the street.